Clinton speaks with the President of Liberia. Former President Bill Clinton came back to Little Rock, Ark. last week, to lead a conversation with the President of Liberia, Mrs. Ellen Johnson Sirleaf. The conversation was part of the Kumpuris Distinguished Lecture Series, hosted by the Clinton School of Public Service at the Statehouse Convention Center. To open the conversation, Sirleaf recounted the horrors of the Ebola epidemic of 2014 that swept the African country of Liberia, resulting in over 10,000 confirmed cases of the disease and just under 5,000 deaths as of May of 2015. Sirleaf described the steps taken by herself and other residents of the country to contain and control the spread of the virus, ending the epidemic a full four years earlier than was predicted by the rest of the world. She gave credit to the Clinton Health Access Initiative for sending the needed medical supplies and personnel that helped to contain the virus. Sirleaf told her own story of trials and tribulations that led to her historic election that made her the first democratically nominated female President in Africa. She credited African leaders Nelson and Winnie Mandela, who provided Sirleaf the inspiration to keep moving up the political ladder. “The activist women in South Africa strengthened my resolve to tackle the biggest challenge – to go for the presidency. To break the glass ceiling. By becoming the first democratically chosen woman president of Africa,” Sirleaf said. Clinton spoke about his first visit to Liberia, after Sirleaf took over the presidency, and the people he met while there. 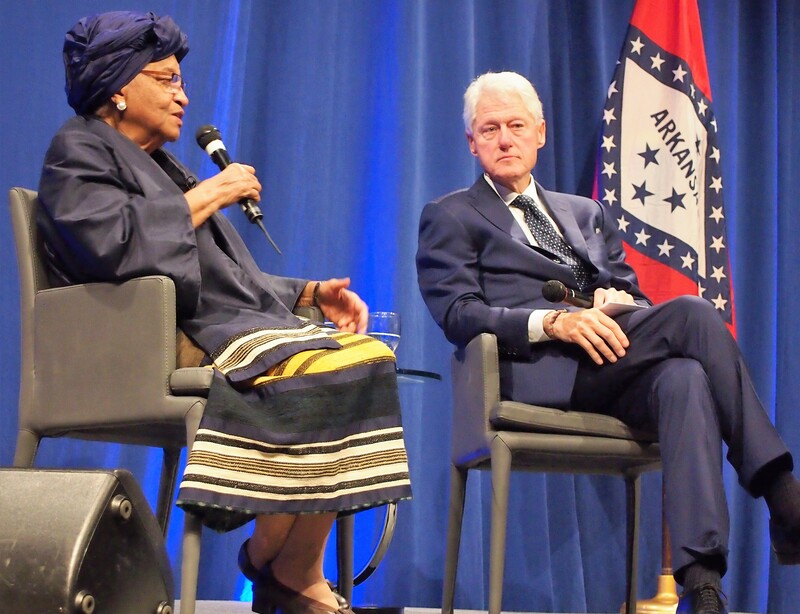 Clinton and Sirleaf also discussed Liberia’s education crisis. The two leaders discussed the state of the economy, tourism, agriculture, healthcare, and women’s rights in Liberia. Sirleaf won the Nobel Peace Prize in 2013 along with two other Liberian women for their continuous work in the “nonviolent struggle for the safety of women and for women’s rights to full participation in peacebuilding work,” according to nobelprize.org. Sirleaf praised the strides that women have made in Liberia, and in Africa, since she became president. She spoke of how the women of her country thank her and give her credit for being able to have their voices heard and respected in matters of importance by men. She gave the example of Rwanda, which now has a 64 percent female representation in their parliament. “America is behind!” Sirleaf said, which earned her a resounding round of applause from the crowd. The Liberian President said she sees strong women every day; working in the market all day, farming at home to feed their families, and carrying the responsibilities and burdens of the home. Clinton wound the conversation down by speaking about what Americans could do to help strengthen Liberia. Sirleaf said they still need help building the roads and strengthening the infrastructure and economy of the country, despite the 4.8-million-dollar grant Liberia just received from the World Bank in November of this year. The grant was given at the official launch of the MSME and Rural Finance Post-Ebola Reconstruction Project. President Clinton stated that “Americans have a certain responsibility to Liberia” reminding the crowd that many of Liberia’s citizens are the descendants of former American slaves who, upon emancipation after the Civil War, got on ships and sailed to the country formerly known as Monrovia, and renamed it Liberia. During the conversation, Sirleaf addressed her coming retirement from the presidency of Liberia, as her country’s constitution dictates. She said that though her experience was fulfilling, her plans for the future are very modest. She plans to spend time on her farm working the land growing rice and other crops indigenous to her country in the village where her father was chief. She also plans to continue her work as an activist, sharing her experiences with other women of Africa through lectures and speeches. Liberia will be electing their new president in just a few weeks. All three of the present candidates are all men.